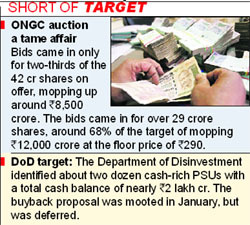 The government is making last-ditch efforts to meet its Rs 40,000 crore divestment target in this fiscal year. The Cabinet Committee on Economic Affairs (CCEA) today allowed cash-rich public sector companies to buy back government�s equity. With increasing incidents of road rage and drunken driving across the country, the government today approved harsher punishment for traffic violations by amending the Motor Vehicle Act. Habitual traffic offenders, drunk drivers and those using mobile phones while driving, would not only be fined five times higher, but also a jail term. Pro-Pakistan hardliner Hurriyat Chairman Syed Ali Shah Geelani had given a recommendation letter to Lashkar-e-Toiba militant Ahtesham Malik, arrested by the Delhi Police from Tughlakabad extension in South-Delhi, for getting a Pakistani Visa. If you want to visit Sikhs� five sacred �takhts� in Punjab, Bihar and Maharashtra in one go, board a special pilgrimage train from Amritsar on Baisakhi, April 13. After showing the first �takht� at the Golden Temple in Amritsar, the 12-day spiritual journey in a 244-passenger Rajdhani-style train will take the pilgrims to four other �takhts� � Anandpur Sahib (near Ropar, Punjab), Damdama Sahib (near Bathinda, Punjab), Patna Sahib (in Bihar), and Hazur Sahib (in Nanded, Maharashtra). 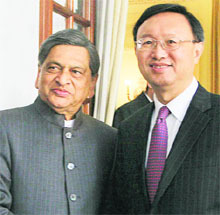 Taking a giant step towards normalisation of relations, India and China today decided to begin a dialogue on maritime issues while resolving to maintain peace and tranquillity along the Line of Actual Control (LAC). The Central Administrative Tribunal (CAT) has upheld the appointment of Prof YK Chawla as the Director of PGIMER, Chandigarh, rejecting the complaint of Dr Digambar Behera, who was among the five short-listed candidates for the post. Dr Behera had challenged the appointment, contending that he was more competent and meritorious and that the selection procedure had been vitiated due to various reasons. In a bid to persuade India to hand over its two arrested marines charged with murder for killing two fishermen, Italy told the Kerala High Court today that it has initiated criminal proceedings against them under its law that could lead to a prison term of not less than 21 years. Illicit drugs are now being ordered online with India emerging as the leading country of origin of internationally controlled substances being supplied worldwide via illegal Internet pharmacies that are coming up in a big way. These pharmacies are using social media, primarily the Facebook, to publicise their websites, putting a large number of people across the world at risk of dangerous substances.